Looking for a work at home job? 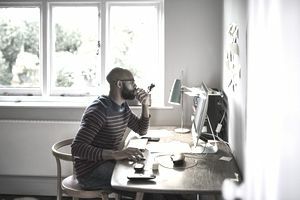 Here's everything you need to know about working at home, including where to find work at home job listings, the best sites for finding working at home jobs, and how to avoid work from home scams. Are there real work at home jobs? Yes, there are some, but they are not nearly as plentiful as you would think considering the amount of interest there is in working from home. They are also sometimes difficult to find. Here's a list of the top jobs to work remotely and three ways to find a work from home job. Despite all the online advertising you see, there aren't as many legitimate work at home jobs as you might think, unless you have the skills that are conducive to freelancing or for working full-time at a position where you don't need to be in the office. There are almost as many scams as there are real work from home opportunities. Here's how to research work at home opportunities to make sure they are legitimate and avoid scams. There are companies that hire for work from home jobs, and you can find work at home job listings online. Many people who work from home started out working in an office, but were able to arrange with their employer to work some or all of time at home. In other cases, you can work as a home-based agent where you are an employee of the company who works from a home office, providing customer service to client companies. Virtual assistants provide administrative, secretarial, and clerical support, as well as creative and/or technical services for clients. Full-time jobs that provide health insurance, a pension, vacation, and other benefits while you work full-time from home, especially if you don't have experience, are few and far between. Finding them online is a little like looking for a needle in a haystack. Despite all the online advertising you see, there aren't that many work at home jobs. Those that are available may require that you live in a certain area or spend at least some time in the office. Others may be part-time or freelance, so you will need to be continually seeking potential positions. Keep in mind that the skills needed for home employment are similar to those needed for working in an office. You need both the experience and the skills necessary to do the job. You'll also need a home office with high-speed internet, phone, fax, computer, printer, software, and other basic office equipment. To get started, consider your job search for your job. Dedicate as many hours per week to your search for employment as you would spend working. If you're looking for full-time work, you should be spending full-time hours seeking employment. Check the sites that list work at home jobs and look through all the listings and remember to take advantage of the resume posting section, if the site has one. That way companies seeking employers will be able to find your resume. Use the job search engines using terms like "work at home", "telecommute", and "freelance". Next, search the online job banks using keywords like "work at home", "telecommute", and "telecommuting". Searching Monster, for example, using "telecommuting" as a keyword generates almost 200 listings. "Work at home" generates close to 1000 positions. Be prepared to apply online. Have a resume and cover letter ready to send. Depending on the type of employment you're looking for, you may also need work samples to send to prospective employers. Track where you've applied. Many of the same positions are listed on multiple sites, so you'll want to be sure not to duplicate your efforts. If you are applying for a work at home job for a company that has a local office, you may be expected to interview in-person. If you are working for a remote company, you may be interviewed via an online interview system, video, Skype, or even via email. Regardless of the type of interview, be prepared to answer a variety of interview questions. If it sounds too good to be true, it most likely is. If you get an unsolicited email telling you that a company that you have never heard of wants to hire you for a job where you don't need experience or skills and can make a lot of money, ignore it. There are lots of scams out there, some of which are personalized and sound quite legitimate. Know the common scam jobs. There are a number of work at home jobs to avoid. These include assembly jobs, multi-level marketing, claims processing, and stuffing envelopes. Many of these positions require you to pay a lot of money, and you see little to no earnings. Read the listing carefully. Make sure you know if there is a salary or if you’re paid on commission. Look into whether or not you need to buy equipment, and if you will be reimbursed. Research the company. If you aren’t sure the company is legitimate, ask for references. If the company won’t provide references, do not apply. Avoid “get rich quick” ads. Be careful of listings that guarantee you wealth or financial success or that will help you get rich fast from home. They will probably do none of the above. Evaluate every listing you look at very carefully. Find out if there's a salary or if you're paid on commission. Ask how often are you paid. Ask what equipment (hardware/software) you need to provide. Find out what support the company provides. Ask for references. Request a list of other employees or contractors to see how this has worked for them. Below are some more tips for finding legitimate work at home positions. Ask your boss. Telecommuting is becoming more and more common. If you have a job you already like, talk to your boss about the possibility of working from home. When talking to your boss, focus on the benefits to your company, for example, emphasize that you will be more productive. Focus on specific companies. To help avoid job scams, focus on legitimate companies that you might want to work for that support telecommuting. Search online. There are a number of job search boards and engines that specialize in work from home positions. Remember to look out for scams. Are Online Paid Surveys Legit or Scams?